@bckenstler I think the correct answer is: don’t do that! @all I was trying with vgg.test for the dogs-vs-cats-redux-kernels-edition on my AWS p2 large instance. I have executed all the steps mentioned in the lesson2 lecture for creating separate directories. But when I perform the step as shown in the picture, my execution gets stuck( indicated by * preceding the statement) until I interrupt. Further steps do not work since the previous step was not executed properly. Any suggestion on how to solve this ? @jeremy Ya the previous time, I didnt let it run for more than 10 mins. Tried it later and worked nicely. Thank you. Not sure why – the path is correct, the directory holds the expected 12,500 jpgs. It seems like the get_batches isn’t finding anything, thus the divide by zero? I’m wracking my brain but can’t think of any reasons why this is happening. Any advice would be greatly appreciated. Have you created a directory named “unknown” under test directory and move all your test images under the directory called unknown ? No, I didn’t do that…I supposed I didn’t realize there was a point of putting it into an ‘unknown’ subdir. Why not just leave it in the ‘test’ dir? It looks like the unknown directory just contains all the test data anyway? 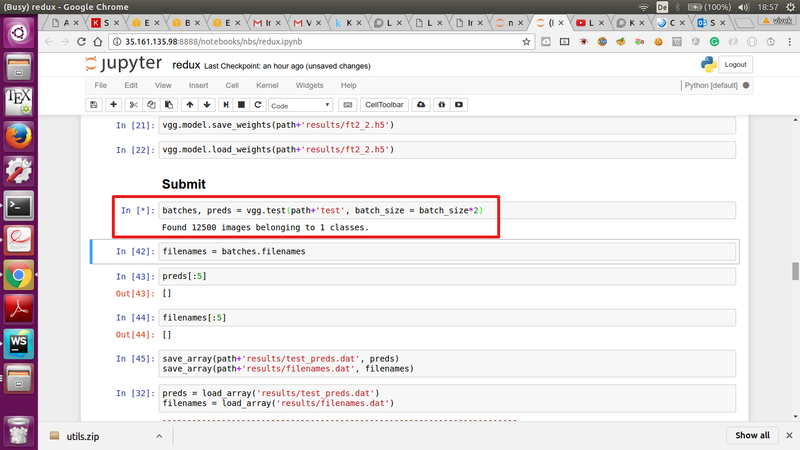 The issue @janardhanp22 is referring to is that keras’ generator needs to know what labels to use for the images. It uses the sub-directory structure for that. If you don’t have labels, you still need the folder structure. Yes exactly what Jeremy explained. Keras is expecting a sub folder structure for labels.